Located in the Suanbo Hot Spring Complex in Chungju, Chungcheongbuk-do, Sajo Resort is the only ski resort in the Chungcheong-do region. Even though it's a smaller ski resort, there are practically no crowds and there is plenty of room to enjoy the slopes. There are six slopes for all levels and three lifts. After skiing and snowboarding, visitors can soothe their tired muscles by visiting the nearby Suanbo Hot Spring. Accommodations can be found around tourist attractions, city hall or the county office. Food in Chungcheongbuk-do is cooked using natural ingredients and uses little oil in its dishes. The region is known for soup and steamed dishes of river fish. You can try the local food at restaurants in towns and near tourist attractions. 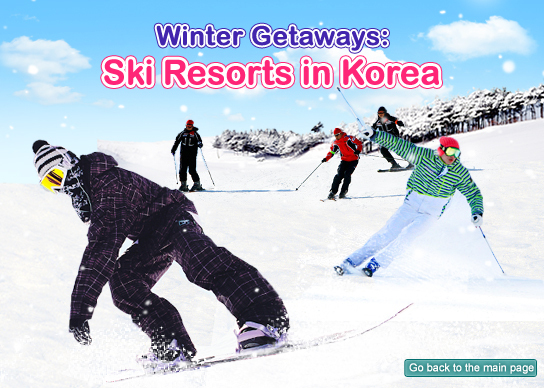 Located inside Deogyusan National Park in Muju, Jeollabuk-do, the Muju Deogyusan Resort has long been a popular ski destination for both Korean and international skiers. This gorgeous mountain ski resort not only has a large number of ski courses, but also has breathtaking views that allow skiers to take in the beauty of the snow-covered slopes while they ski. The resort's Silk Road Slope, which starts 1,520 meters above sea level from the peak of Mount Deogyusan, is a fantastic course that skiers describe as "gliding through the clouds." At 6.1km in length, the Silk Road Slope is the longest run in Korea and was designed for beginner and intermediate skiers. The resort is divided into two main sections, the Manseon Base with 12 slopes, and Seolcheon base with 10 slopes, which includes the Silk Road Slope. For a refreshing experience, try the outdoor hot springs after a day of skiing. Jeollabuk-do is one of the food capitals of Korea along with Jeollanam-do. It is known for using great ingredients, red pepper powder and salted seafood. You can try local food at restaurants in towns and near tourist attractions. Located 1,200 meters above sea level on Sinbulsan Mountain in Gyeongsangnam-do, Eden Valley Resort is the only ski resort in the South Gyeongsang Province. Of the seven slopes (ranging in length from 454 meters to 1,495 meters), two are for beginners, three are for intermediate skiers and two are for advanced skiers. Each slope has a different starting point, but they all wind gently down along the mountainside to come together at the base. The three lifts are so fast that there is hardly any waiting. The resort also offers tube sledding and sleigh rides. Embracing the ocean, mountains and plains, Gyeongsngnam-do has a diverse food culture. The food has a relatively stronger taste as more red pepper powder and salted seafood are used when cooking than other regions. You can try local food at restaurants in towns and near tourist attractions. downtown and near tourist attractions. 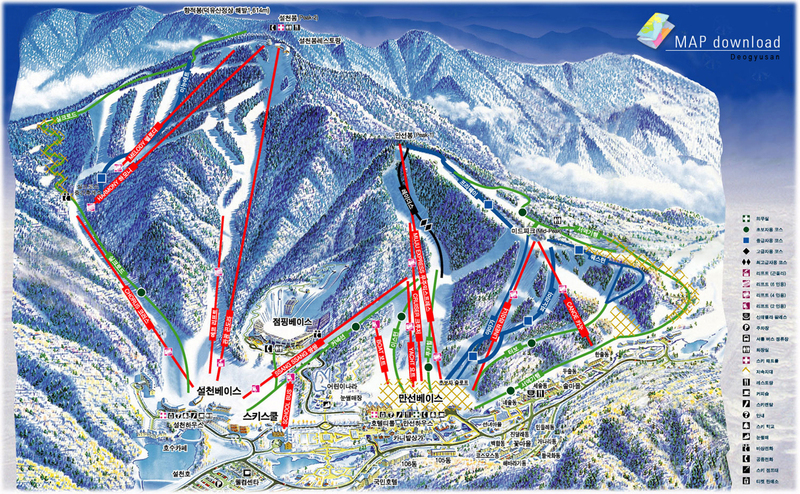 ※ The opening period of each ski resort is subject to change.